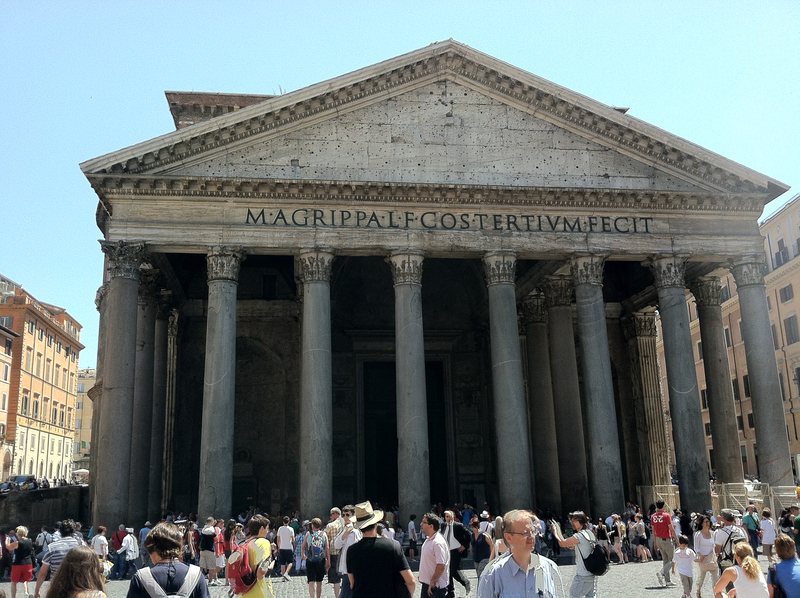 Almost any informed list of the most famous historic buildings of the world will include the Pantheon of Rome. Its longevity since the mid-second century is important but not the most important reason why; its grandeur and size are staggering, even more so when one one enters its vast interior dome. Its genius may not be immediately obvious but its statement of Roman imperium is very clear. Its intended impact includes its allusions to sacred geometry, its engineering marvel and its summation of the cosmos the Romans ruled can even be seen in its pavement under one’s feet. Look high up into the 27 foot wide oculus of the dome and heaven itself is organized in a dramatic way both by day and night. In antiquity natural sunlight illuminated the interior by day and moonlight or starlight illuminated it by night, although even on a moonless or cloudy night when torches could have been needed, the expanse of darkness made a statement that night filled the oculus. The oculus was apparently intended, however, to be the only source of light in antiquity along with the entry door. Dedicated by the emperor Hadrian around 126-8 CE over the previous Pantheon structures including the first building around 27 BCE under Marcus Agrippa, whose posthumous inscription M AGRIPPA L F COS TERTIUM FECIT (“Marcus Agrippa son of Lucius built this in his third consulship”) Hadrian employed to signify Augustan connections, it was not only a temple to some of the major gods of Rome – Pantheon as “temple of all or every one of the gods” – and their celestial representations but also a testimony to the imperium of Rome over the world it ruled. 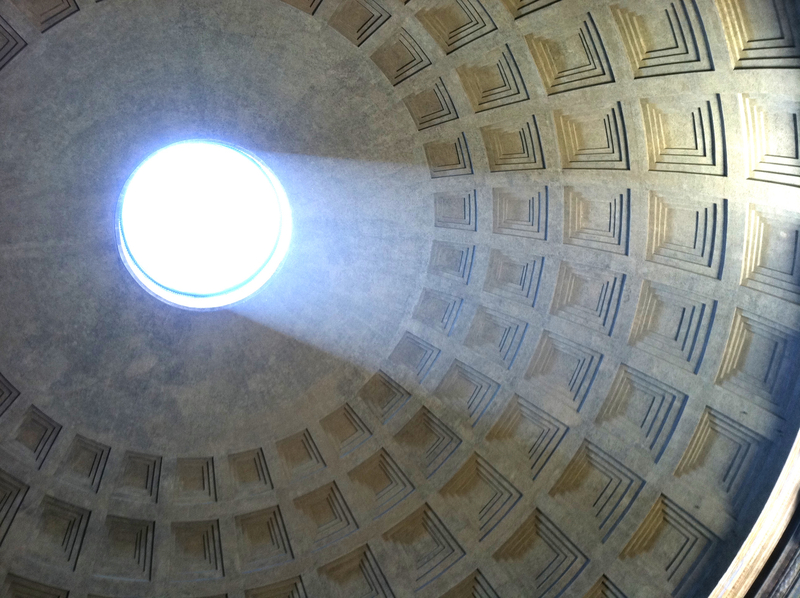 How much of the Pantheon is Hadrianic is uncertain because it is not claimed in his list of works and he rarely placed his name on his projects. Although slightly after the fact, Cassius Dio (ca 155-235 CE) said it was named either after all the gods who resided in it or in his opinion because it resembled the vault of heaven itself. Even modified considerably since the structure was formally Christianized in the early 7th century and previously partly restored under Septimius Severus and Caracalla around 202 CE, the original Roman genius survives. For sacred geometry, its space was marked by the volume of a sphere, since the height of the dome was exactly the same as its width (43.3 meters, 142 ft.) in the interior where a sphere would perfectly fit if the dome were to be extended downward in the cylindrical drum. 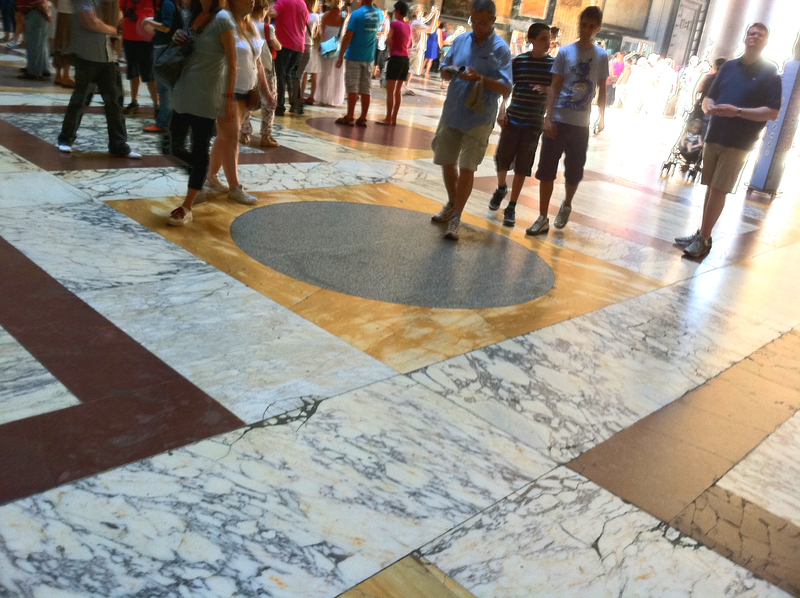 Additionally, it depicts circles, squares and triangles in many of its features, for example, both in the patterning of the Pantheon floor pavement made of repeated squares and circles as well as structurally since the portico is nearly a squared rectangular and its external pediment is a triangle, 1.5 times higher than normal according to Vitruvian standards (de Architectura 3.5.12). In reality the dome measurements were intended to be perfect as 150 Roman feet of the internal sphere and the oculus width as 30 Roman feet. 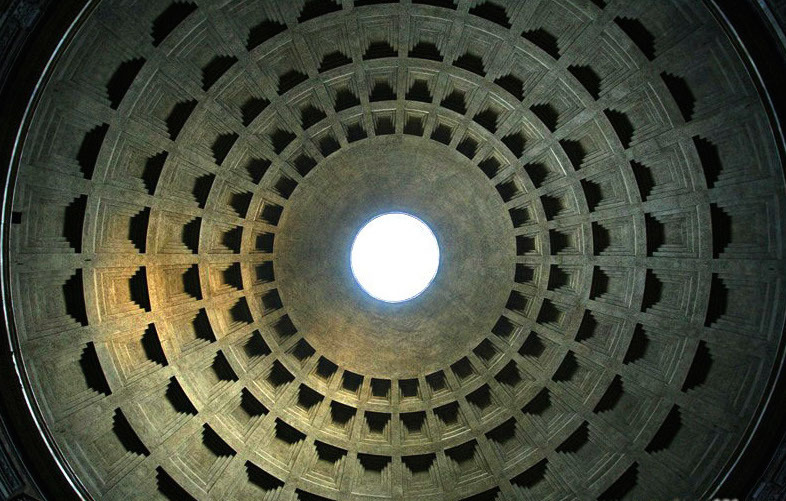 To date, no unreinforced concrete dome in the world exceeds the Pantheon’s interior dimensions. For added effect of its sacred geometry and its celestial references, the dome’s five rings of laqueraria coffers (28 in each ring, possibly approximating a lunar month) of the vaulted ceiling emphasize the orbitals of the five planetary gods, beginning with Jupiter and in separate rings, Saturn, Venus, Mars, and Mercury – although the order is rarely agreed on – plus after the ring framing the oculus itself are Sol and Luna as the sun and moon seen through the open oculus into the vault of the second, much vaster ceiling of the day and night sky, hence referencing all the cosmocratores who rule the heavens. Roman astronomers could certainly track these planetary deities across the sky even with retrograde motion at times as ‘asteres planētai in Greek (ἀστέρες πλανῆται) or “wandering stars”. Even the depths in the recesses of the increasingly smaller coffers toward the center are graduated according to a predetermined curve, all part of the sacred geometry tending toward squares and circles with interior triangular pediments over the niches above the cylinder echoing that shape, among other triangulated elements. Others have also suggested the tracking of the sun with its beams of light across the interior acts as a natural sundial throughout the year, although it is doubtful interior markings have been retained to evidence this possibility. The Pantheon’s consummate engineering is established in various ways. The composite materials include stone (including marble, tufa and travertine), brick and concrete of different formulae, and its construction rests on segmented brick arches in both hidden interior and seen on the exterior where the marble veneer has been stripped away. The thickness of the dome itself reduces from nearly 20 feet at its base to around five feet at the oculus, and the weight was further reduced by increasing use of very light pumice in the concrete mix. other materials originally included at least 16 Egyptian Mons Claudianus granite columns with marble capitals holding up the portico, as granite has an enormous weight-bearing capacity and compression strength. The pavement floor of the Pantheon is also slightly crowned in the center for rainwater entering through the oculus to run into side drains to reduce standing water on the floor. Some have argued that around the base of the cylindrical drum supportive basalt foundation orthostats can be found – although this is debated – and if so, basalt has an even greater weight-bearing capacity and compression strength than granite. Relieving arches are also found throughout the drum on all three levels. Eight massive piers also relieve internal weight, and bays are found along eight barrel vaults. The overall weight of the composite materials is carefully planned to maintain stability by reducing pressure and load the higher the structure reaches. Further Roman imperium may be suggested in the stone scheme of the pavement floor, where although the stones used are commonly seen elsewhere in Rome from at least Trajan onwards, the colored circles and squares have a provenance that includes imperial porphyry from Mons Porphyrites (Djebel Dokhan) in Egypt, Docimian marble (Docimian pavonazetta) from Asia Minor, Numidian yellow marble from Chemtou (Giallo numidiana) in former Carthaginian territory and an unprovenanced grey granite, the latter whose geological source is not fully known although now often referenced as Granito bigio, a later term. Additionally, Greek green porphyry (Lapis Lacaedomonius) can also be found in a horizontal ring around the drum as well as elsewhere. The above italicized stone names are primarily Renaissance designations. If the entire Roman world and its conquests (Egypt, Carthage, Asia Minor and Greece) are thus represented, perhaps the grey granite has a European or Alpine provenance rather then Egypt, already represented, and may thus reference Gaulish territory. 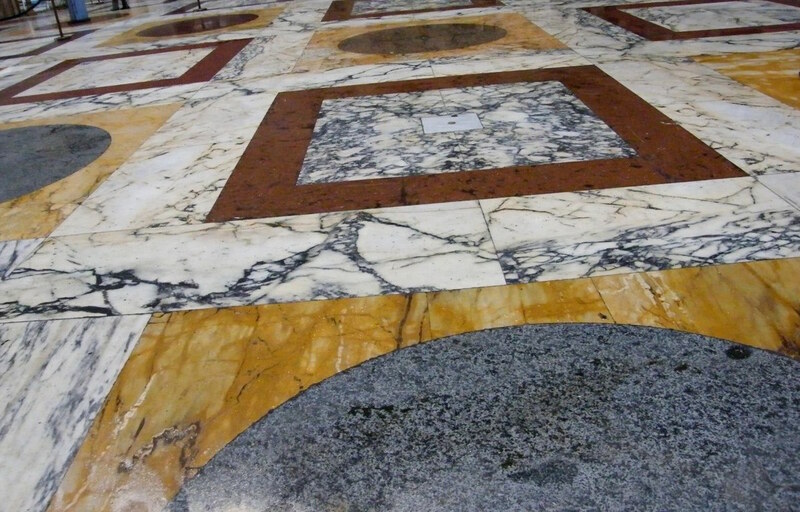 If not necessarily an absolute reference to Roman imperium, the distinctive colors nonetheless are carefully distributed across the pavement and the sophisticated Roman world knew well the obvious colored stone sources. I’ve forgotten how many times I’ve been to Rome, but each time I never fail to visit the Pantheon because it always both humbles and amazes, always showing something new. 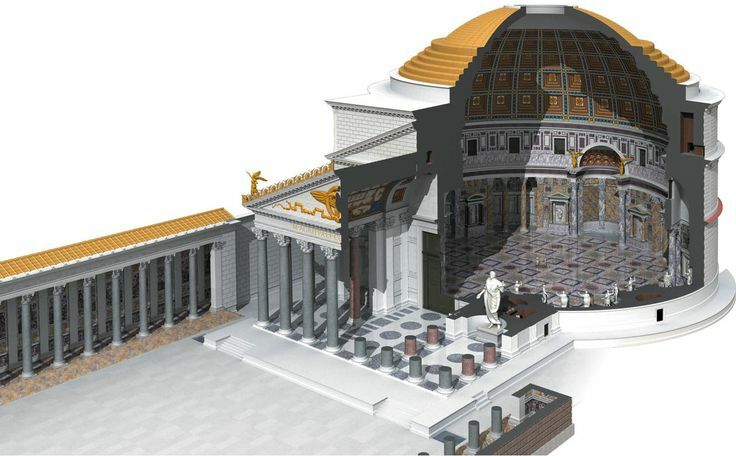 In conclusion, it is likely that no other surviving Roman building better exemplifies imperial architecture with its statements of sacred geometry, engineering strengths and imperium than the Pantheon, and we are much better able to comprehend the greatness of Roman architecture because of this lasting marvel. Amanda Claridge. Rome: Oxford Archaeological Guide, Oxford, 2010, 49, 174, 226-33. Filippo Coarelli. Rome and Environs: An Archaeological Guide. Berkeley: University of California Press, 2014, esp. 286-9. Patrick Hunt. 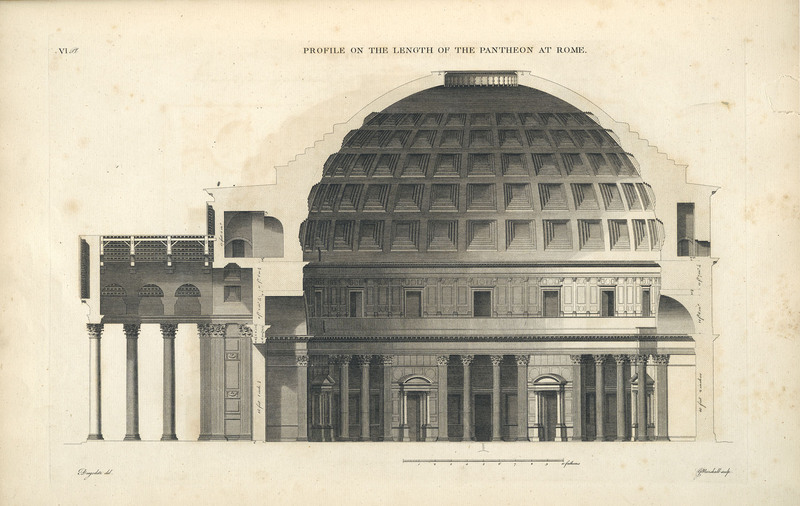 “Pantheon” in the Encyclopedia of the Ancient World, Salem Press, 2002, vol.2, 868. Patrick Hunt. “Imperium in the Pantheon of Rome and its Pavimentum.” Philolog (Stanford) Dec. 2005. William L. Macdonald. The Pantheon. London, 1976. Frank Sear. Roman Architecture. Cornell University Press, 1992, 166-72. Nicholas Temple, “Changing Identities in the Oecumene: Geography and Identity in the Greco-Roman World,” in S. Bandypadhyay and G. G. Montiel, eds. The Territories of Identity: Architecture in the Age of Evolving Globalisation. Abingdon, Oxford: Routledge, 2013, ch. 1, 3-18, esp, 14-16.